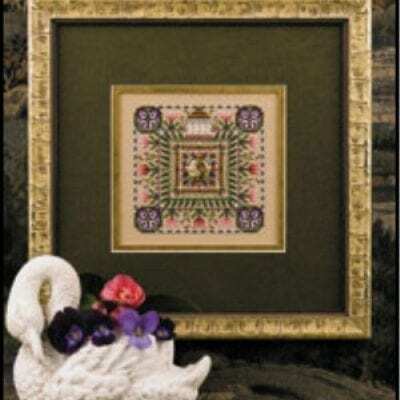 Another limited edition pattern from Just Nan. Instead of a mouse, this one has a 3D bunny for its occupant. Pattern includes ribbon to tie roof shut, pink felt for lining, 6 pieces of cardboard for stability, pale pink seed beads, pom pom tail, antique brass button and pink rosebud. 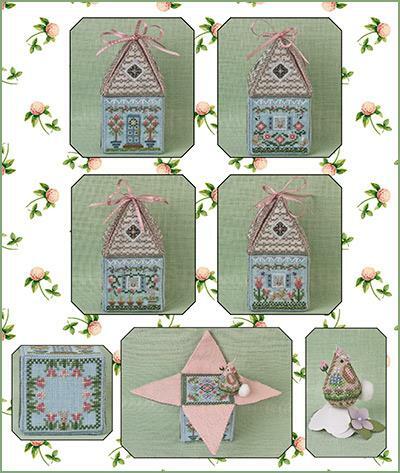 The finished size of the bungalow is 5″ tall x 2 1/4″ wide. Floss used is from DMC and fabric for bottom of bungalow (153H x 115W) is 32 count Weeke Dye Works Morris Blue linen, the roof (106H x 106W) is 32 count Weeks Dye Works Platinum and the bunny is 32 count Country Mocha Vintage Belfast linen from Zweigart.